Dawson loves rainy days and as long as it's warm rain and there is no lightning, we go out and play in the rain. 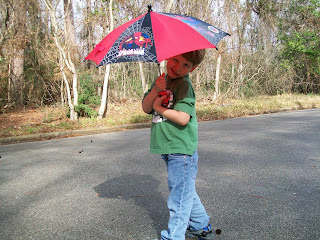 He has really been looking forward to a rainy day so he would have a chance to use his new Spiderman umbrella. 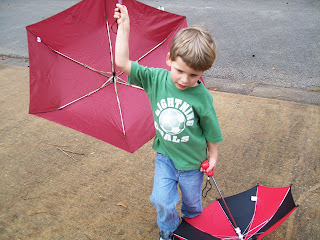 He managed to stay dry under the umbrella for about 5 minutes, but after that had more fun carrying it alongside him and letting the rain drench him. Carrying his umbrella and my umbrella as we await the rain storm. Making a silly face as he shows off his umbrella.